When we moved into our new home, I was beyond thrilled to have my own closet. In our previous home, my husband and I shared a walk-in closet. Which was doable, but I always wanted my own space. In this home, I have my own walk-in closet, while my husband have a standard closet (which suits him just fine). I thought that the walk-in closet had more than enough space for all my things, but within a very short period of time (I'm talking once I unpacked all my clothes), I had run out of space. I guess it doesn't take much when you have a mountain of purses and shoes to store. I told my hubby that I wanted to redo the closet, but with all the other changes we were making to the house, this was far from priority (well, for him at least). He did agree to redo it during his August holidays this year (so sweet, right?). Pretty bad eh? You'll see that there really is a lack of storage. There is a lot of wasted space on top, and lots of wasted space on the empty wall to the left. 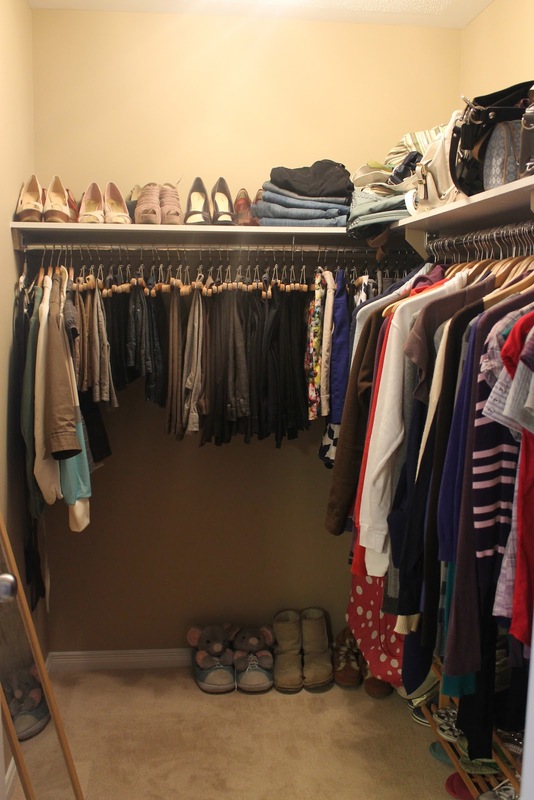 Before I designed my closet, I thought I would look at some storage solutions and closet configurations for a smaller walk-in closet like I have. I love the use of space in this small closet. Everything has its place. Plenty of room for everything - shoes, purses, hanging clothes, and drawers for folded clothes. Corners can be such an awkward part of organizing a closet, so I love the clever use of this space. It allows for plenty of room for folded clothes, shoes, or purses. shelf where I could store jewelry. I love the idea of using the space over the door. This was something that I have already decided to do in my own walk-in. My goal is to use every inch of space. Do any of you have a small, but very functional closet? Any advice to give for my own redesign?